It has been a very busy week with work and getting our house ready for hosting Thanksgiving. (We will be sleeping 8 in what is technically a 0 bedroom house!) 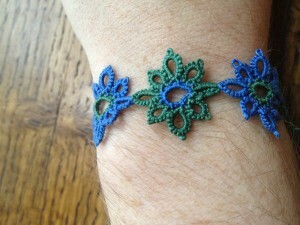 Not a whole lot of time for tatting, though I’ve been working on a few small projects. I’m excited to report though that I received this original copy of Priscilla Tatting #3 in yesterday’s mail. Sometime between 1924 and today it lost its cover and to be honest, I haven’t unwrapped it from its sarn wrap packaging to check if all the other pages are there, but for some reason Priscilla Tatting #3 has been the hardest of the four to find. So now I have a complete set of book 1-3 and the crochet and tatting yoke and collar book. 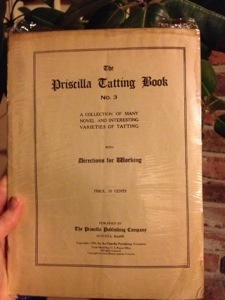 If anyone knows of any other Priscilla tatting books, please let me know. I have one of the Modern Priscilla magazines, and may eventually decide to collect more. They’re pretty interesting to flip through. I also have a couple of the Coats and Clark Priscilla booklets, but don’t plan on collecting those. I actually have been picking up multiple copies of book #2. There’s a couple different publishers who printed the Priscilla books and at least two significantly different versions of book #2. Haven’t determined yet if there’s multiple versions of the others. Which actually leads me to my next reader question. I’m also looking for more information on the Priscilla Publishing Company. If anyone has any ideas on where to find more info that would be wonderful. There’s not a lot on the web, but I’ve found they were based out of Boston and thought there might be some more local historical sites out there. When I finally get the big Modernizing of the Priscilla patterns out there I’d like to be able to include information about the publishing company, the women writing the patterns and he women who read the magazine. Any ideas welcome. As a side note, this is the first post I’ve made on my iPad using the WordPress app. Hopefully the picture and formatting will come out alright. I’m pretty excited about the possibility of being able to post from the iPad while on the go! This week I finished up one of my samples for the Shuttlebirds Tatting conference. The project is one that has 4 shuttles going at once so it’s not very portable. I’m glad to have it finished now and have only more portable projects to travel with. 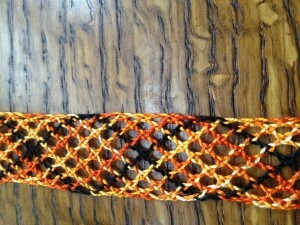 This week I also did another quick bracelet with a bit of thread left on a shuttle. This is an edging pattern from one of the Priscilla books. I think it makes a nice bracelet and I like using the black as the shuttle thread rather than the chain thread which was the first way I envisioned it. I still need to get the directions for the flower edging pattern written up. Maybe that will be this weekend’s project. Been quite busy and doing some traveling which has cut down on the tatting some, but since I’ve been quiet for a while I’ve got a few projects to talk about here. This one is the first piece of bobbin lace I’ve made in years. I’ve been inspired by some of the bobbin lace I’ve been seeing at the Lacemakers of Puget Sound meetings. I don’t expect to get super into it, but I bought a new lace billow with a wheel so that I can make a longer piece. 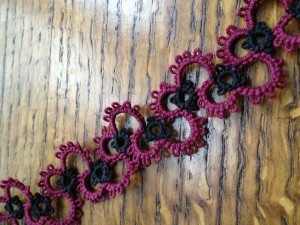 I’d like to set up one piece of lace that can just keep going and going so I can work on it whenever I feel like it. I’ve picked out the pattern I want to work on, but there’s a few things I need to learn before I get started on it, so I’ll do a few more practice pieces before I set up the big one. However, I’ll be doing it slowly so don’t expect any new updates on bobbin lace anytime soon. Tatting is still what’s going to be keeping me the most busy.